Grocery stores, supermarkets, convenience stores... from name brands to mom and pop shops, the retail experience has changed drastically over the years. Self-service grocery stores however, both large and small, have remained largely unchanged since their inception in 1916 by Piggly Wiggly. The introduction of the shopping cart in 1937 by Sylvan Goldman, owner of the Humpty Dumpty supermarket chain, further upended the grocery market. Since then, there have been relatively few changes in the grocery shopping experience. So what’s next for grocery and retail? In this post, we’ll examine the future of how customers might experience their local grocery store, and ways to stay one step ahead of the competition. As technology has matured, so have the applications that are readily available to leverage. The gig economy has enabled streamlined delivery services, advances in machine intelligence has brought the self-checkout machine, and breakthroughs in IoT have provided a foundation for cashierless stores. There is a lot to wade through and understand, so it's important to remain vigilant with how the grocery industry evolves, what takes precedent, and what falls flat. Instacart, and other grocery delivery service like Google Express or Amazon Prime Fresh, have redefined what it means to go grocery shopping. These new services are interesting for a very particular reason: despite the surge to ecommerce and online shopping that are leading to the decline of the brick and mortar concept, these delivery services are bolstering the need for physical stores. Despite the consumer having no contact with the storefront, they are still supporting the physical store through use of the delivery service. In order to stay relevant and remain competitive, it's vital that grocery stores go beyond simply supporting these services. In most, if not all cases, the grocery retailer does not have to change their practices in order to sustain this implementation of the gig economy. But how can retailers go beyond the norm and shine brighter than the competition? One method may be to combine self-checkout and cashierless services along with a smaller workforce to reduce costs. Each grocer needs to understand this technology and the following ones to remain competitive. Self-checkout machines, invented in 1984 and popularized in the 1990s, have evolved from a staple in our modern way of life: the self-service grocery store. Originally, clerks at grocery stores would compile requested food items and charge based on weight, but as we mentioned earlier, Piggly Wiggly saw an opportunity to reduce costs by eliminating the need for clerks. More recently, David R. Humble took this idea further and invented the self-checkout machine, effectively eliminating the need for cashiers. 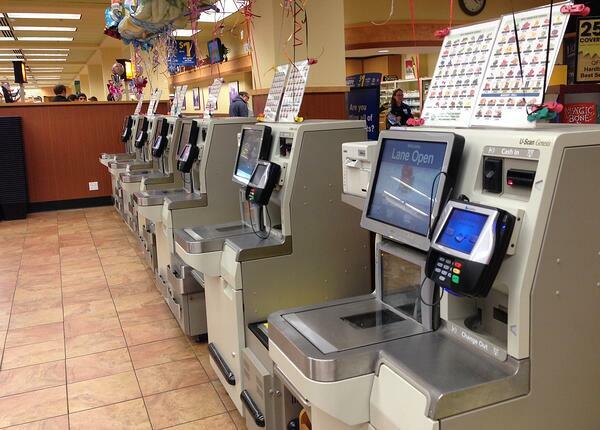 Despite this invention, cashiers are still widely popular and the norm in retail. These machines have the potential to save costs on labor, but in doing so, retailers are putting more employees out of work. This tradeoff should be a consideration if grocers are to implement self checkout machines. On one hand, the impersonal experience of a self-checkout machine may turn away customers, but ignoring cost-saving technology has historically been a sure-fire way to failure. Some grocers and retailers have adopted self-checkout machines while retaining their cashiers, which suggests that this technology may become a compliment to existing tech, rather than a replacement. Even more striking than a self-checkout machine is the lack of a point of sale (POS) altogether. Another idea of Piggly Wiggly’s founder Clarence Saunders was to create an automated grocery store, similar to a vending machine. 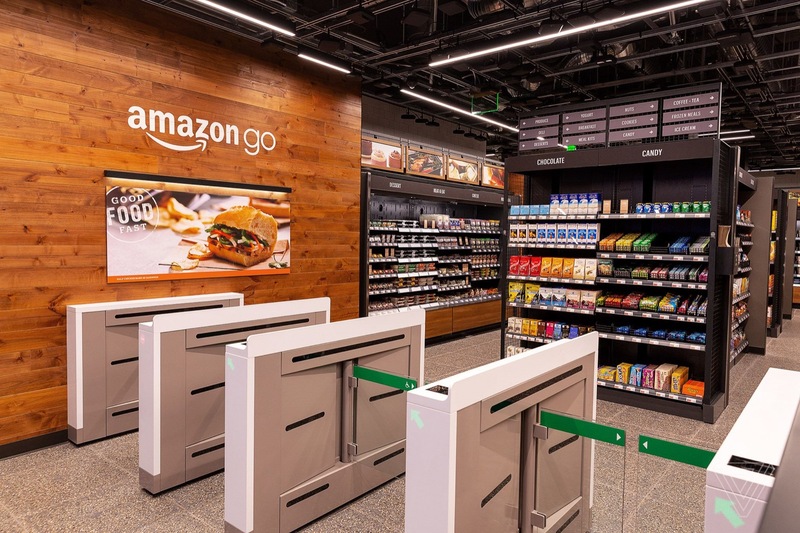 Today, Amazon has taken this a step further with their cashierless stores. In essence, you can walk into a store, grab your goods, and walk out. An app on your phone will then charge you the amount of items you purchased, effectively replacing cashiers altogether. This will further reduce costs and increase the foot traffic through the store by eliminating lines for checkout, but will come at the expense of fewer jobs available in retail. This is an additional opportunity to stay competitive and reduce costs, but may eliminate the reason customers would venture to a specific store in the first place: excellent customer service. The future of retail and grocery isn’t all doom and gloom, as there are plenty of technologies meant to improve customer experience with no downsides. Take for instance, end-to-end digital food safety. Too many grocery stores are left in the dark with pen and paper methods of tracking temperatures of refrigerators, both in-store and in-transit. With a remote monitoring solution, temperature excursions can be identified in real-time and provide actionable alerts that enable proactive food safety. This helps to keep customers safe and prevents problems before they occur. The future of retail is unknown, but there is at least one guarantee: technology will continue to shape our experience, and in order to remain competitive, grocers must understand all of the tools available at their disposal.